FiberSmartz OSS is a fully integrated end-to-end OSS for service order provisioning, trouble management, and scheduled maintenance to flow electronically across a service provider's organization. FiberSmartz creates consistency and efficiency across the organization while providing visibility in business processes and resource allocation. The OSS application is tightly integrated with multiple external systems i.e. CRM, Trouble Management, Circuit Inventory, and Customer Portal. Automation of tasks and workflow creation: inefficiencies are reduced when tasks are created autonomously with their relevant dependent tasks starting automatically when upstream tasks are completed. Real time view of order status: Automatic calculation of projected start and end dates of each task based on workflow selected provides clear visibility into the overall status of the order. Integrated systems to avoid redundancy:Integration of upstream and downstream date with Trouble Management System, Customer Care Portal, Circuit Inventory, CRM and other third party applications. n Meaningful reports and trend analysis: Data consolidation for forecasting and reporting. Meaningful reports and trend analysis: Data consolidation for forecasting and reporting. Affordably priced for companies of all sizes: Low cost of ownership. Fibersmartz OSS is comprised of 5 main modules. Modules can be procured as one fully integrated system or as standalone modules. The FiberSmartz OSS Provisioning Workflow Module streamlines the provisioning process, speeds service delivery, and provides comprehensive process visibility and provisioning metrics. FiberSmartz Circuit Inventory is a user friendly, functionally rich, highly configurable network planning and management system for fiber and wireless backhaul providers. The Circuit Inventory can be procured as a standalone system or pre-integrated with the FiberSmartz OSS Provisioning Workflow System, Trouble Management System, Customer Care Portal and CRM System. While providing low cost of ownership, Fibersmartz Circuit Inventory simplifies and speeds circuit and facility design and scheduled maintenance. Circuit Inventory makes it easy to identify circuits and customers affected when an outage occurs or network maintenance is planned. The FiberSmartz Trouble Management Module manages trouble tickets, network maintenance, facilities and OSP maintenance initiation to closure. Tickets are initiated, assigned, and tracked through their full lifecycle. 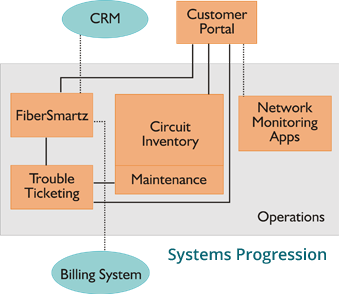 Pre-integrated with customer data from the FiberSmartz Provisioning Workflow Module and Fibersmartz Circuit Inventory Module, it is interoperable with other fault and network management systems. The FiberSmartz Customer Care Portal provides customers with a highly personalized, interactive service on the web 24 x 7. With a range of self-service options the Customer Care Portal increases customer satisfaction as well as long-term retention. Designed with the needs of fiber and wireless back haul service providers in mind, the FiberSmartz CRM Module offers many of the contemporary features offered by Enterprise CRM providers, but at a fraction of the cost.